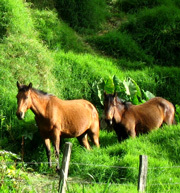 Volcan Pacifica, Chiriqui, Panama: Why it's a sound investment. Why Choose the Volcan region, and the Volcan Pacifica Development? Safe, secure and very private, yet with quick, easy access to local facilities and amenities. A beautiful landscape as far as the eye could see. Land that would provide a high number of properties with excellent views. The land must be fully titled. Dealing with an established company: We are a company that has spent four years and over eight million dollars on our original development, Sunset Point. When you are thinking about relocating to another country, particularly if you are looking to retire, you want to make sure that the company you decide to invest in has the right credentials and attitude. We take a great deal of care, both with our customers and with our development. If you have any questions, please ask us, or we can refer you to existing owners at Sunset Point. Although Volcan town is well established, it also has quite a frontiers-town type feel. A vibrant, little sprawl of a town, with friendly locals, four supermarkets, numerous (good) restaurants and a couple of banks. Ranchers ride through on their horses, side by side with the 4 x 4's. And then there's the Volcan Barú National Park, 35,000 acres of cloud rainforest, the proximity to Costa Rica, the Atlantic coast an hour away, the gorgeous year-round temperatures, the fact that barely any development has touched this region and yet the infrastructure is excellent ... find out more.